Please note stock is very low and we will not be able to replace this great value large dolls bed. We suggest you put it away now for Christmas! The Love Hearts Metal Framed 18"-20" Doll Canopy Bed & Bedding (Pink) is an ideal bed for even the tallest dolls. It measures 21.75" length x 12" width x 25.5" height (55cm length x 31cm width x 65cm height). 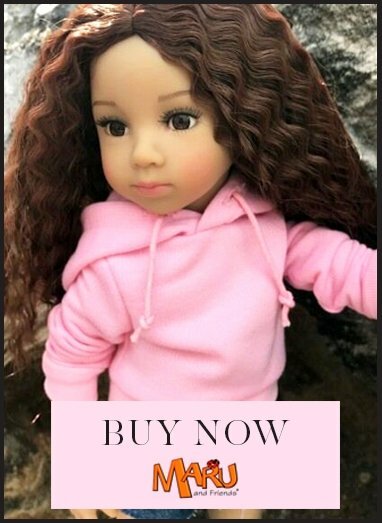 It is therefore perfect for:- American Girl Doll, Fun In Faith 46cm Doll, Gotz Classic Kidz 50cm Doll, Gotz Hannah 50cm Doll, Gotz Happy Kidz 50cm Doll, Gotz Precious Day and WeGirls 46cm. Dolls Not only is it a great size for the dolls to stretch out to sleep, it makes the ideal hanging-out place for girly catch-ups, as 4 dolls can sit on top of the bed, ideal if your dolls will be having midnight feasts! The silver metal frame arrives in 5 pieces and takes just a couple of minutes to assemble, no screwdrivers needed, as the pieces just slot together! A great feature is that the bed has little wheels on the 4 corners of the bedposts, so that the bed can be moved about a bedroom easily, ideal when there is a shortage of space. The bed comes with a valanced mattress, matching pillow, cover and curtained canopy, all in a love heart patterned polyester fabric of white, hot pink and blue. This pretty, eye-catching canopy bed is an ideal bed for 46cm - 50cm play dolls (18"-19.5" dolls) or even a doll up to 55cm in length. Many doll beds available look like cots/ cribs or cradles which is not really what girls over the age of 4 want. They want a doll to go to sleep in a bed that doesn't look like a crib. This is a girl's wish bed! Please check the height of the doll against the length of the bed before purchasing, to ensure it will fit. Please note that this bed must be assembled, dismantled or reassembled by an adult. Shipping to mainland UK only! There may be some box shelf wear to this item which is the reason for the sale price.